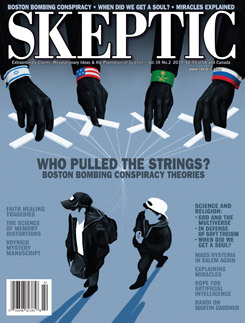 THE SKEPTICS SOCIETY is a nonprofit 501(c)(3) scientific and educational organization whose mission is to engage leading experts in investigating the paranormal, fringe science, pseudoscience, and extraordinary claims of all kinds, promote critical thinking, and serve as an educational tool for those seeking a sound scientific viewpoint. Our contributors—leading scientists, scholars, investigative journalists, historians, professors and teachers—are top experts in their fields. It is our hope that our efforts go a long way in promoting critical thinking and lifelong inquisitiveness in all individuals.